Enhance your Land Rover Freelander's factory side and rear gate emblem letters with this unique decal set that fits perfectly on top of the existing factory emblems. These decals are designed so that the existing emblem slightly outlines the new decal as shown in picture. 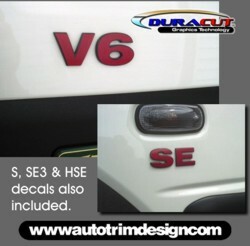 Decals are packaged to cover S, SE, SE3, HSE and V6 emblems. Available in a wide variety of colors (shown in Red). Combine your order with our Hood Lettering (ATD-LNDRVRFDCL1) for a complete conversion! Includes easy-to-follow online instructions. Get yours today!